This is a small-to-medium sized dolphin with a dark gray or black back and a distinctively two-toned dorsal fin. Also, it has a long, lighter-gray patch on its fore side that leads all the way to a short, dark-gray beak. Its throat and underbelly are white. But above all, this species is most easily recognized by the thorn-shaped patch of dark color between the white stripes on its back. That aside, it’s very easy to mistake them for other species out in the wild. Dusky dolphins eat a wide variety of fish and squid species and have quite flexible hunting tactics. Similarly, this animal is one of the most acrobatic of all cetaceans and is popular for spectacular aerial displays. The dusky dolphin is a very social being. They’ll often move about in groups numbering up to thousands – though pods of 100 to 200 members are most common. They also associate freely with other dolphin species like the common bottlenose dolphin, pilot whales, and other marine mammals like southern right whales and South American sea lions. For now, the exact numbers and status of this creature is unknown. However, it’s very frequently caught in gill nets. The IUCN lists the Dusky Dolphin as a Data Deficient species. The largest of the dusky dolphin species are those around Peru. They grow up to 210 cm (6 feet) in length. Those around New Zealand grow up to between 167 and 178 cm. Males and females do not vary too much in size. Adults grow to between 70 and 85 kg. The largest recorded specimen was 100 kg (210 lbs). Just like other medium sized dolphins, these ones are very swift swimmers. They will swim along beside fast boats and bow ride after them all the time performing aerial acrobatic displays. Dusky dolphins perform some of the most spectacular acrobatic displays of all cetaceans. They perform leaps, backslaps, headslaps, tailslaps, head-over-tail leaps, spins, and noseouts over and over again. They are friendly and harmless to humans. However, their flesh is valuable as meat for human consumption in some regions especially in Peru. Peruvian fisheries take from between 10,000 and 15,000 of these dolphins yearly for people to eat. Also, hunters use them as bait to attract and snare sharks for consumption too. Consequently, the Peruvian subpopulation may be displaying the effects of over-exploitation soon. The New Zealand subpopulation is not caught for food but is caught incidentally in gill nets though the situation is gradually improving there. Dusky dolphins are the subject of many whale-watching tours. In fact, they are one of the main attractions for cetacean watching in New Zealand waters. The industry continues to grow in other areas such as around Patagonia and Argentina, and is a replacement for the original whale-watching industry centered around the southern right whale. New Zealand now has several locations for visitors to view and swim with dusky dolphins, mostly in Kaikoura and Marlborough Sounds. There is also a thriving dusky dolphin tourism industry in Argentina. However, that of New Zealand is larger and is more regulated to avoid disturbing the dolphins. For most of the year, dusky dolphins separate into different subgroups; mating adults (mating groups), mothers with calves (nursery groups), and non-breeding adults. Mating adults of both sexes do not keep to one partner and may copulate with as many as they choose to. However, males must win the attention and approval of the females to mate with them. So, the males will pursue females in high-speed chases. In the same fashion, females tend to prefer faster males though they will try to extend the chase for as long as possible. Eventually, only the fastest and most agile males will get her. In addition, the dusky dolphin is one of the few animal species that engage in sexual activity outside breeding purposes. Males have been seen occasionally engaging in homosexual behavior. Mating occurs in spring, with pregnant females producing a single calf after an 11-month gestation period. Breeding normally peaks in summer (November to February) around New Zealand and Argentina, and in winter (August to October) around Peru. Newborns measure around 55 to 70 cm at birth and mothers wean their calves at about 18 months old. Calves in particular are vulnerable to predators like the killer whale and harassment from adult male dusky dolphins seeking to mate with nursing females. Furthermore, dusky dolphin calves have a lot of learning to do. Particularly in the area of performing leaps. They are not born with the ability for aerial acrobatic displays and must watch others of their kind to learn. In the shallower waters off New Zealand and Argentina, these dolphins forage mostly during the day. The hunt in well coordinated groups chasing schools of fish or squid. They do this to confuse and herd them into stationary balls. Unfortunately, their efforts quickly attracts other large predators especially killer whales and large sharks that may end on preying on them too. Though, they avoid killer whales by swimming into shallow waters. The hunting efforts of the Dusky Dolphin is so successful that it quickly attracts other predators like killer whales, seabirds, other dolphin species, sharks, and pinnipeds. Dolphin hunting is now illegal in Peru (since 1996). Also, this particular species is protected from international trade under CITES. The IUCN lists it as a Data Deficient species. 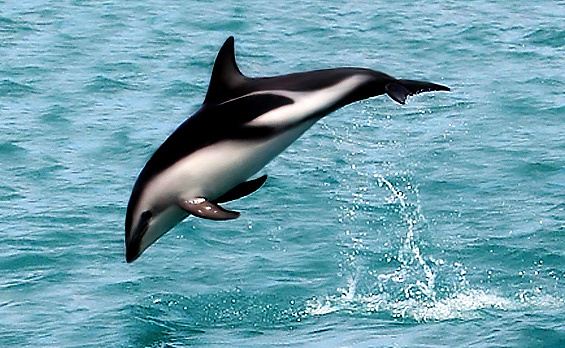 The closest relative of the dusky dolphin is the Pacific white-sided dolphin. These two different species appear to have diverged about 1.9 to 3.0 million years ago. There are reports of possible hybrids from breeding between dusky dolphins and long-beaked common dolphins. 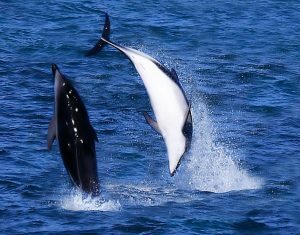 There may also be hybrids with the southern right whale dolphin. The dolphin’s range is scattered but with more concentrations around parts of South America, south-western Africa, New Zealand, and various smaller oceanic islands. There are also sightings around Australia and Tasmania. They prefer to swim in cooler currents and inshore waters, but will often venture offshore.